make this a good time to finish off any deep digging. 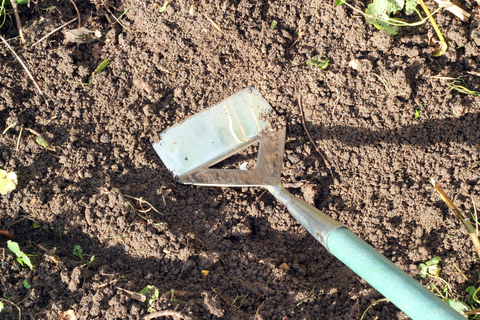 If you’re on sandy loam then you’re spared the digging and just need to lightly fork over the vegetable plot, removing any weeds or vegetable residue. If you wish you can cover areas with cloches or polythene to help warm up the soil ready for early sowings of carrots, radishes, lettuce and summer cabbage at the end of the month. Shallots can be planted, making sure they are deeply seated so the birds can’t pull them out before they root. Try planting Jerusalem artichokes and make successional sowings of broad beans and peas under fleece, again at the end of the month. Meanwhile hoe the weeds out of beds and generally prepare by clearing out old beds of Brussels sprouts and cabbages.